Following on from our survey of 707 international schools in 98 countries last year, we have again scoured the globe, to update and improve on last year’s report. 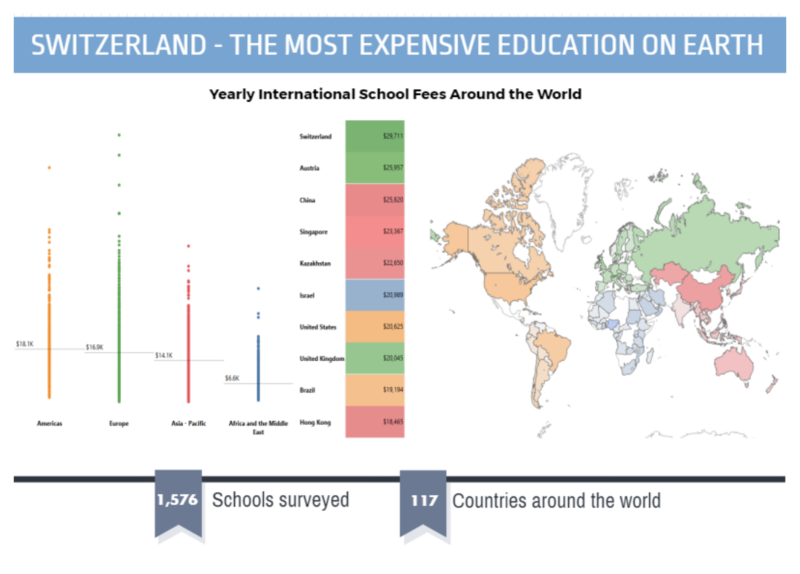 This year, ExpatFinder presents our International School Fees Survey 2017, a study of the pricing and availability of 1,576 schools in 117 countries across the globe. “The rising cost of international education is exacerbated by increased demand from wealthy or even middle-class families of emerging nations in Asia and the Middle East who want a grounding in international curricula (International Baccalaureate or an American High School Diploma) for their children. We have also seen significant reductions in subsidies offered by home governments and international schools, further compounding the financial outlay of expat parents who may already find fees at top-end international schools out of reach. This year has seen an increase in tuition fees of 2% across the globe, with some continents and countries significantly exceeding this number. For example, the American and Asia – Pacific regions saw price increases of 6% and 7%, respectively. With costs of living increasing all over the world, and workforces becoming more globally mobile, we can expect tuition fees to be consistently trending upwards. Last year, Forbes reported that the international schools market will be worth US$89 billion by 2026. 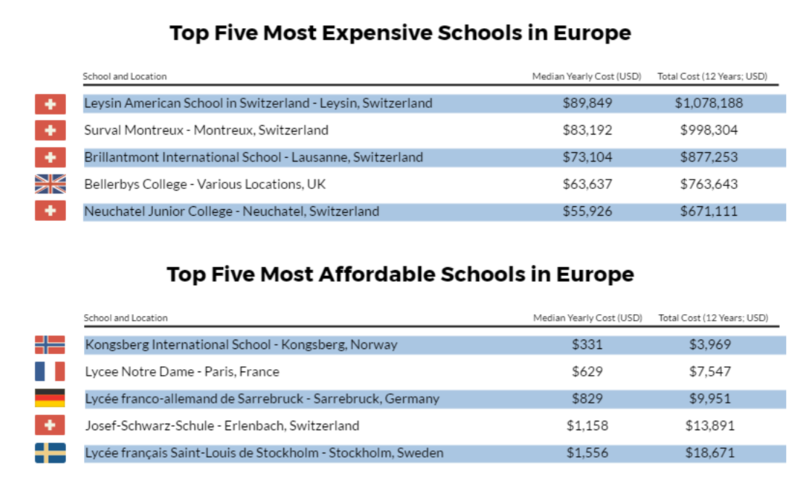 Across the 1,576 international schools surveyed, the total cost of a single child’s full education varied between US$1,078,188 for Leysin American School in Switzerland and US$3,969 for Kongsberg International School in Norway. 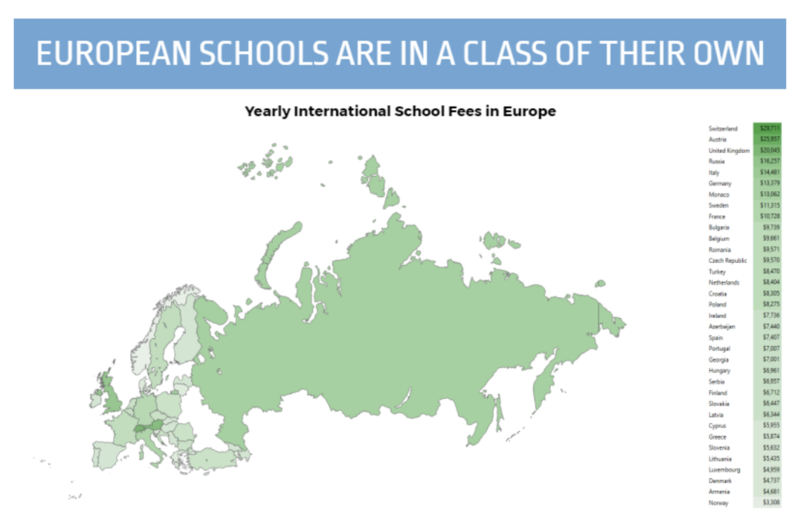 This comparison acutely demonstrates the vast gulf observed between the highest and lowest international school fees across the globe. 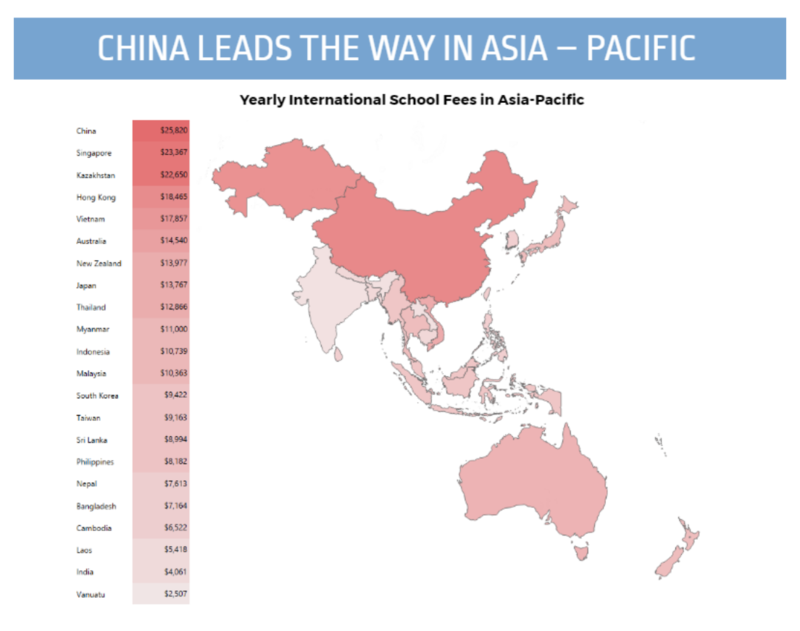 Since last year’s report, the average school prices for Asia – Pacific have increased by a 7% to US$14,150 per annum. This is the largest continental increase seen this year and highlights that although the region is already popular with expatriates, the interest in the area shows no sign of slowing down. Kate Farr – British expat living in Hong Kong. 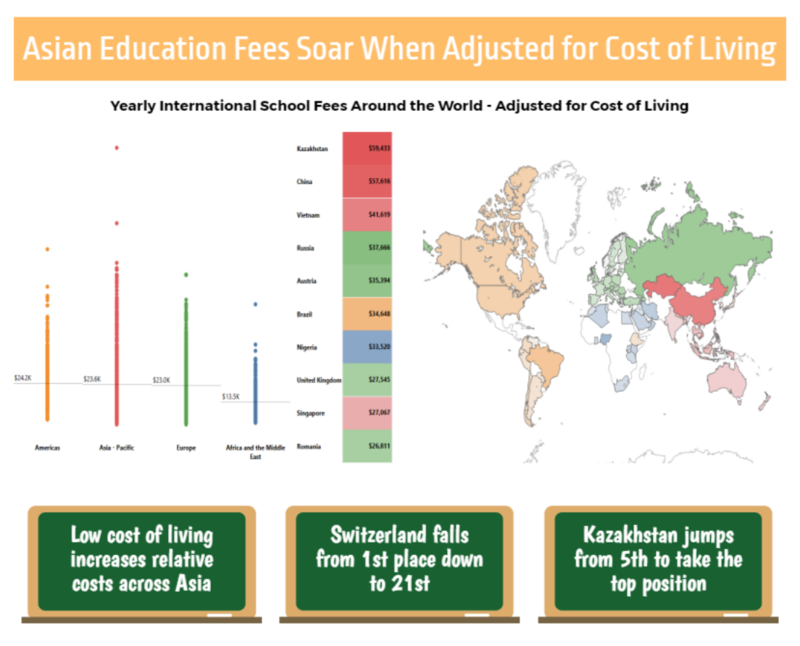 Not only does Asia have four of the ten most expensive countries in the world for international education, but when the figures are adjusted for the relative cost of living, Kazakhstan (US$59,433 per annum, adjusted), China (US$57,616 per annum, adjusted) and Vietnam (US$41,619 per annum, adjusted) shoot to the top of the leader board. Also, when this adjustment is made, four of the world’s five most expensive schools are within the region (between US$161,156 and US$91,198 per annum, adjusted). This significant shift in the rankings is most likely due to the low cost of living found throughout much of Asia, especially in nations such as Vietnam (US$17,857 per annum) and Thailand (US$12,866 per annum). Residing in these poorer areas can vastly increase the relative cost for expatriates and locals, in these regions, meaning that school fees in these areas might not be as attractive as at first glance. Europe (US$16,855 per annum) contains some of the countries with the world’s highest costs of living, and certainly, some of the most expensive international schools available, with four of the five most expensive schools found on the continent (between US$89,849 and US$73,104 per annum). Although the Americas have a higher average yearly cost (US$18,070 per annum), Europe comes both first and second for the most expensive countries to attend an international school, whereas the United States (US$20,625 per annum) sits back in fifth place. 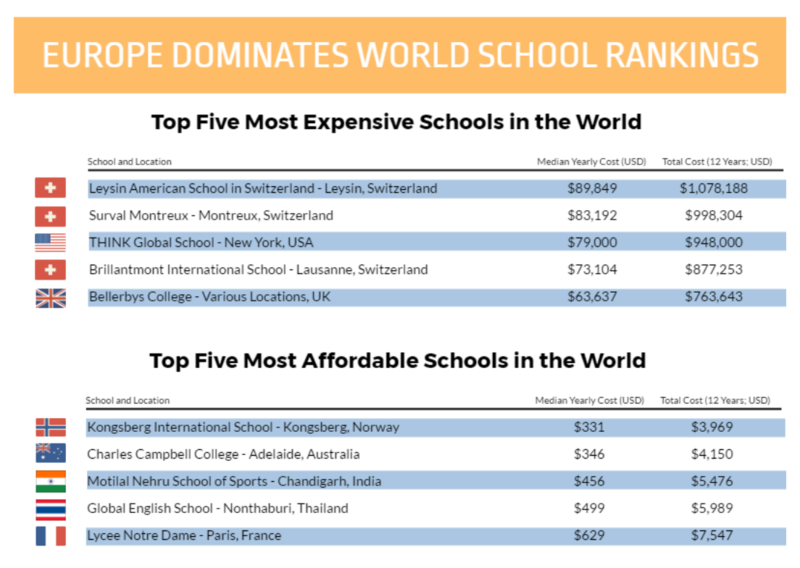 Within Europe, Switzerland (US$29,711 per annum) is the standout player, with four of the most expensive schools on the Continent, and three of most costly in the world. However, this dominance is only the case regarding absolute figures. When the fees are adjusted for the cost of living, Switzerland falls to 21st place with a yearly median of US$22,955, showing that it might not be as pricey as at first glance. Under the broad umbrella of international education comes an array of different schooling systems, from classic British boarding schools to language-specific French offerings. Deciding which system is right for your children can be tricky, as although all will provide a high quality of education, other cultural factors may be significant. 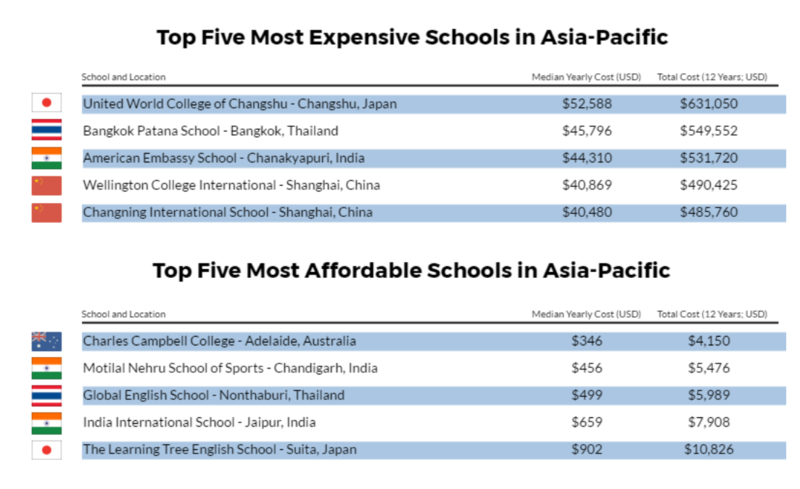 Of the various schooling systems surveyed around the world, it is clear that the Australian schools are the most expensive, with a median yearly fee of US$24,166. American and British schools are also some of the more expensive, with median annual costs of US$19,126 and US$17,896, respectively. 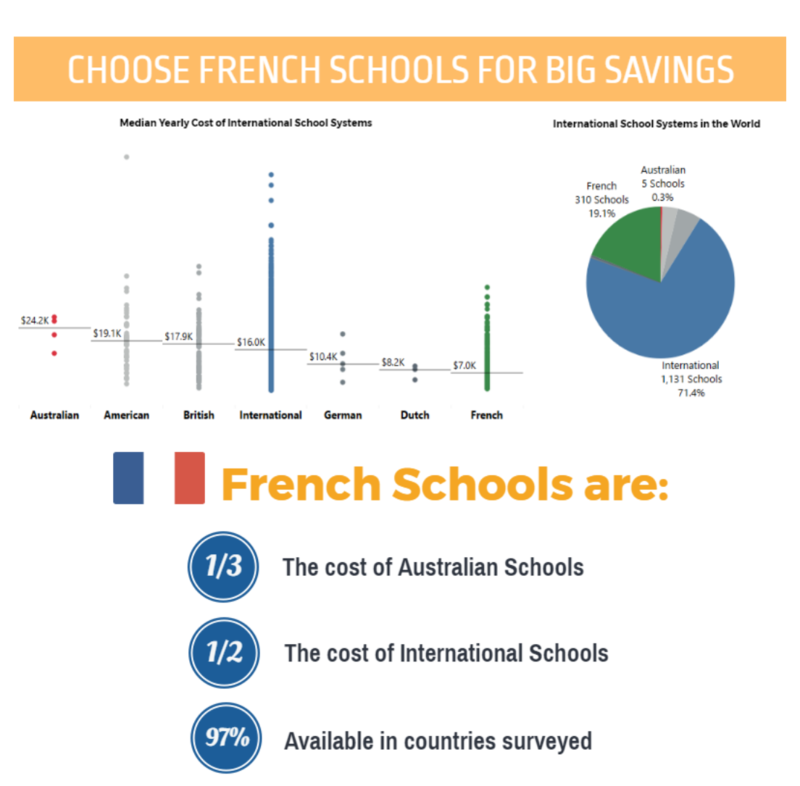 French citizens should rejoice, however, as the French schools around the world came out as cheapest in our data, with the median yearly tuition fees coming in at only US$7,019, less than one-third of the cost of Australian Schools. In some cases, companies will subsidise or even completely cover the costs of education for their employee’s children, but if this is not the case, you may find that the expenses become a significant burden. Luckily though, many of the international schools we assessed offer subsidies to students if they are from the origin country of the particular system the school uses. Therefore, if you are a German citizen, you may be able to secure funding to cover some of the costs of sending your children to a German-based International school. Not only are schools already offering these subsidies, but some governments will further subsidise the costs of schooling. In addition to this, some embassies are opening their own schools, to ensure that the local population of expats can provide their children with the proper native teaching that parents may want to continue from their home country. Unfortunately, the number of governments offering these schemes, and the funding available has been decreasing, as governments continually tighten their budgets in volatile financial times. In response to these funds drying up, schools are starting to introduce higher corporate rates, which supplement the fees for expat children, lowering the costs for all of the pupils. Naren Damodaran – Executive/Senior Global Mobility Professional. Are Corporate Schools the Future of International Education? In addition to rate subsidies and tuition payments supplied for some expatriates by their employers, some companies have gone a step further and started up schools for their employees’ children to ensure a high quality of education while on assignment. These corporate academies are often run in tandem with an international school in the region and are an elegant solution for overcoming the potentially large financial burden of education for their employees. Maxime Michel - Corporate School Project Manager for Mission Laïque Française. This new system of education will become more and more pervasive over the coming years, as many countries move towards a more global structure, and require a high level of mobility for their most valued employees. If a company can control its own schools at its various locations around the world, it can ensure that a constant high quality of education is available for its employees’ children, no matter where they are. Regardless of the situation in which you are moving, or planning to go abroad, these are some serious considerations for you to be making early on in your relocation. Where are the best and most prestigious schools for you children? How expensive are these schools? How are you going to be able to cover these increasingly significant costs? All school fees data was taken from the relevant schools’ websites or kindly provided by the schools themselves. All yearly school fee costs were calculated as the median yearly cost, including tuition fees; application, admission and enrolment; registration and re-enrolment; building and capital development; one meal a day; school uniforms; and exams. The relative fees, adjusted for cost of living were calculated from Numbeo’s Global Cost of Living Index, available here.